The sunshine returned to Northumberland today, allowing me to enjoy myself firing the oven and baking these different breads. The sourdough seed bread takes inspiration from the Hamelman formula, but uses a stiff levain, very different leavening procedure and flour combination. The flavour from the tamari-roasted seeds is intense. I made the Leinsamenbrot in bread pans, although this is probably not authentic. I used my liquid rye sourdough plus a flax seed soaker with 3 times water to seeds. So the hydration in the formula is very high; intentionally so. I'm pleased with the final result at 40% rye, 60% white flour. The Roasted Almond and Raisin Breads have a biga pre-ferment and I finished off my current supply of fresh yeast in the final dough. There is butter in the formula, but no sugar, or spice. They baked beautifully in the brick oven too! Recipe/formulae details given below, plus photographs. Build the levain as shown. Prepare the soaker the night before. Roast the seeds ahead of time to allow them to cool before adding to the dough. In the mixer, combine the flour with the water and soaker and mix 3 minutes on first speed, scraping down to clear. Autolyse for 1 hour. Add the salt and levain and mix 2 minutes on first speed and 6 minutes on second speed, scraping down as needed. Add the roasted seeds and mix on first speed to clear. DDT 28°C. Prove in bulk for 2½ hours; stretch and fold after 1 and 2 hours. Scale, divide and mould round. Rest 15 minutes and prepare bannetons. Re-mould. Bake in the wood-fired oven. Build the Rye Sourdough as shown, and prepare the soaker the night before. Mix the soaker, sourdough and white flour using a paddle beater, on first speed for 3 minutes, scraping down, until clear. Autolyse for 1 hour. Add the salt and mix for 2 minutes on first speed and 4 minutes on second speed. Use the hook if it picks up the dough, otherwise stick with the paddle beater. DDT 28°C. Bulk Ferment for 2 hours. Scale and divide into prepared bread tins. Prepare the Biga the night before. Combine all the ingredients in the mixer except the fruit and nuts. Mix on first speed until clear, scraping down as needed. Mix for 6 minutes on second speed with the hook attachment. Rest the dough for 20 minutes then add the fruit and nuts and mix to clear using a Scotch cutter. DDT 28°C. Scale and divide into 3 x 1kg pieces; mould round. Rest 15 minutes then shape as bloomers. 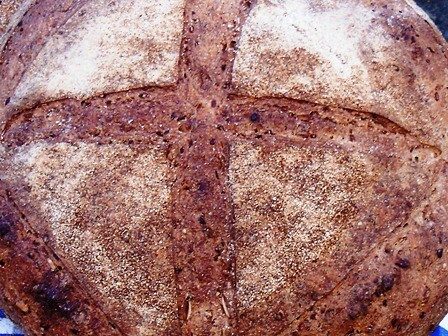 Score the tops of the loaves, glaze with egg and bake in the wood fired oven. What a hearty, wholesome bake of loaves...I did see a dab of butter : ) in my favorite pick..though, it's hard to imagine the a flavor of the tarmari roasted seeds...I'm not familar with. It's hard to beat baking in beautiful weather and a wfo, I can imagine your enjoyment. Yes, plenty wholegrain here: 25% in the bloomers, 50% in the sedd bread and 40% in the leinsamenbrot...plus lots of lovely fruit, nuts and seeds too. The bloomers smelled buttery when they came out of the oven. They are baked very much as flavoured breads rather than significantly enriched. Tamari is a superior type of Soy Sauce from Japan. Lovely to hear from you; thank you as ever for your kind words. 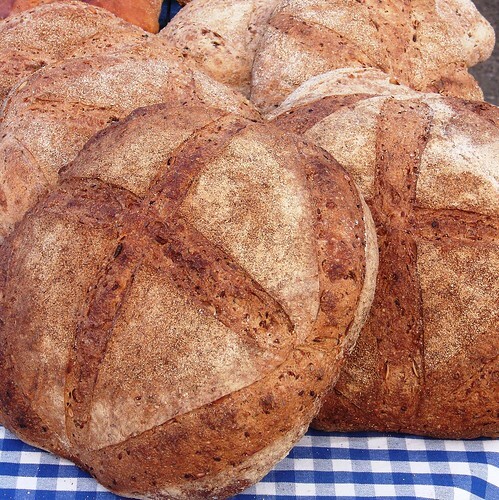 Always these great breads - a joy to behold! The Sourdough Seed Bread is my favorite, the crumb looks lovely. Being a bad German I prefer wheat rye breads to the really dark ryes (don't like sauerkraut much either). I put your Levain with Seeds on my "Equal Opportunity Baking" list, as one of the (trusted) fun breads among the alien (probably hostile) ones from neglected baking books. There are quite a few to choose from now Karin! This particular seed bread is definitely the best I have made so far; so you should probably go with this formula. Yes, it's fun, but it packs a very tasty punch too! It is so good to get positive feedback about my photographs. Generally I don't think I always do justice to my breads. But, yes, the pictures always turn out so much better if I can capture photos outside in the sunshine! That really is what the crumb looks like on the seed bread...and lunchtime beckons! Not that I'd turn away a slice of either the Sourdough Seed or Leinsamanbrot, but your Roasted Almond and Fruit Bloomers are blooming awesome! No doubt destined for the local market, so I'll have to imagine what the crumb looks like, but judging from the profile of the loaves I'm sure it's airy and open. Some lucky customer is in for a treat with any of these splendid loaves Andy. Well, I'd buy those Fruit and Nut Breads, and that is a good measure of quality in bread. Yes, they were scaled at 1kg, so pretty big loaves, but came out of the oven feeling light and airy as you suggest. How are the markets going? Speaking of fruit breads, I just baked some spiced fruit sourdough for a friend - cloves, nutmeg, cinnamon, allspice and soaked raisins/sultanas. Nat was very happy that baked one for us as well ... been a while since I baked with white flour. A Treat! When I put this formula together, I was so tempted to make spicy breads as I have a lot of nice sweet spices in at the moment. But I plumped for a more simple flavoured bread instead. This version has 25% wholewheat flour. I'll try for something more rich and spicy next time. The crumb structure of the Sourdough Seed Bread is truly astonishing. Besides the beautiful breads, I do like your photography and the way you laid out your formula also. You're using some conventions that are new to me. Thank you so much for your kind words; the comments are very much appreciated, especially coming from you. Photography is a big "hit and miss" affair for me. Regarding the formulae, I include all the detail which I know is useful to me. I know they are not written out according to SFBI or BBGA, but they take the reader straight to the key bits of information which I look for when assembling recipes/formulae. I'm glad you like these too. AMAZING Andy. First rate all the way. Your customers are being coddled and spoiled! Do you ship to far, far away deserts? I could use some coddling and spoiling. Only "virtual" tasting available here dabrownman, sorry! Those breads look delicious. If only I could taste them as well.